Most people do not spend a lot of time thinking about their teeth, but this can change dramatically when something hurts. When you have a toothache, the pain and discomfort can be overwhelming and even keep you awake at night. We have even had patients tell us that childbirth is more comfortable. The best way to avoid this is to prevent it, but if you are already in pain, then you may need a root canal to provide relief. Dr. Chang and the team at Bloomvale Dental are specifically trained in comfort care and are here to get you OUT of pain. Root canals can be fully or nearly painless. We set the tone right from the start with advanced anesthesia techniques and calming amenities such as headphones and warm blankets. But most of all our team will take care of you and put you at ease right from the start! When a tooth has a severe infection, it threatens your entire mouth. The infection can easily spread and may even invade your blood, leading to serious health consequences. But a root canal can often save a tooth, preventing the need for an extraction. 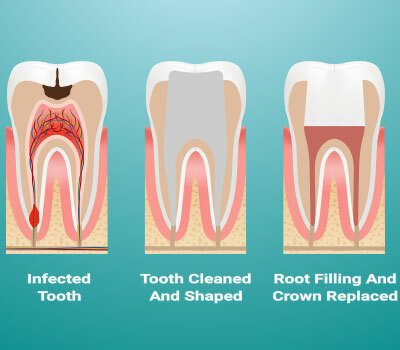 By removing the internal infection, Dr. Chang can get the tooth ready for a crown and leave you with all your natural teeth intact. For comfortable root canal treatment and other quality dental services, call Bloomvale Dental. Get out of pain by calling (951) 325-4600 today.